Whether or not you care for the sound of jingling bells and a rooftop echoing the click, click, click of reindeer hooves, there’s no escaping holiday music. Along with ornamented trees, candles, and nogged eggs, it’s parcel and part of December’s latter weeks. To join rather than beat the holiday spirit, you may wish to pipe such music throughout your home. Here are a few ways to do so—as well as where you might go to find some new holiday tunes. If you live in a smallish apartment, whole-home audio is a cinch. Attach a couple of powered speakers to your computer, phone, music player, or tablet; press the Play button; and crank up the speakers until they rattle the mistletoe dangling in the farthest corner of your home. If you’ve moved beyond such small quarters and find yourself needing to fill multiple rooms with music, your job is more involved—and more expensive—though not terribly complicated. As a user of Apple products, the obvious choice is to explore Apple’s AirPlay technology. For those unfamiliar with AirPlay, here’s the gist: With music stored in your computer’s iTunes library or on an iOS device, you can wirelessly stream that music to AirPlay-compatible devices. In Apple’s world this means an Apple TV, and AirPort Express Base Station, or any set of AirPlay-capable speakers. An Apple TV is an inexpensive AirPlay desination. With an Apple TV or AirPort Express, setup is simple. Just plug in your Apple TV or AirPort Express and configure it so that it uses the same local network as your computer and iOS devices. (The Apple TV and AirPort Express have AirPlay switched on by default.) The Apple TV will play your audio through whatever AV device it’s connected to, using an optical-audio cable: a stereo or home-theater receiver, a TV, or powered speakers. The AirPort Express plays through any audio device connected to its audio-output jack (which, unlike the Apple TV’s jack, handles both analog- and digital-audio connections). But you needn’t stick to Apple’s AirPlay devices. AirPlay has been incorporated into a number of third-party products, including powered speakers from such companies as Altec Lansing, B&W, iHome, Klipsch, JBL, Libratone, Logitech, Pioneer, and Sony. And if you prefer the speakers you already own, audio companies such as Denon, Pioneer, Yamaha, and Onkyo are shipping AirPlay-compatible receivers. To send music over AirPlay in iTunes 11, click the AirPlay icon just to the right of iTunes’s volume slider; when the list of AirPlay-capable devices on your local network appears, choose the one you want to play your audio through. If you want to stream your music to multiple destinations, click the Multiple button and then check the box next to each AirPlay device you intend to use. Within this AirPlay menu, you’ll see that you can adjust the volume of each device individually, as well as use the Master Volume slider to raise or lower the volume of all devices proportionally to their individual settings. If you have a Mac running Mountain Lion, you can stream any audio that Mac produces to a single AirPlay destination. To do so, open the Sound pane of System Preferences, click the Output tab, and choose the AirPlay device you’d like to use. (Apple’s documentation claims AirPlay Mirroring works only with mid-2011 or newer iMac, Mac mini, or MacBook Air models; and early-2011 or newer MacBook Pro models. However, this limitation applies to video mirroring. Any Mac that can run Mountain Lion should support audio mirroring.) If you have an older Mac that doesn’t support Mountain Lion, you can instead use Rogue Amoeba’s $25 Airfoil to stream your Mac’s audio to AirPlay-compatible devices. On an iPhone or iPod touch running iOS 6, you’ll find an AirPlay button on the Music app’s Now Playing screen, just to the right of the volume slider. On an iPad it can also be found next to the volume slider, but it’s visible on every screen as the iPad has more elbow room to display it. Many third-party audio apps also provide the AirPlay button, letting you stream the app’s audio over AirPlay. Unlike with iTunes on your computer, it’s not possible to stream from an iOS device to multiple AirPlay devices simultaneously. Convenient and free though AirPlay may be, it’s not the perfect solution for all occasions. For example, if you wish to play different music in individual rooms from the same source—modern holiday music in the living room, traditional holiday music in the kitchen, and soulful holiday music in the bedroom, all playing from your Mac’s iTunes library, for instance—you’ll find that AirPlay isn’t up to the task. It can handle streaming one track to multiple units, but not different tracks to each unit. One solution would be to use a different source device for each room. In this case, your Mac could stream to the living room, an iPhone to the kitchen, and an iPad to the bedroom. If you already own these devices, it’s an affordable way to go. But you get greater flexibility from a system designed for multi-room play, such as audio gear from Sonos and Logitech’s Squeezebox units. These are wireless hardware systems, consisting of multiple devices, that allow you to stream different tracks to each unit. They support not only music in your iTunes library, but also Internet-based streaming-music services. Sonos provides access to a greater number of these services, but each lets you play music from Pandora, MOG, Spotify, Slacker, Last.fm, and Rhapsody, which each offers more holiday music than any one household can bear. (A recent Sonos software update even lets you stream different tracks from the same iOS device to different Sonos units.) These devices can be controlled from your computer, from free apps you install on your iOS or Android devices, and from dedicated hardware controllers. A Sonos system makes it easy to stream music throughout your home. You’re now up to speed on how to play your music throughout your home. Now, how about some sources for that music? 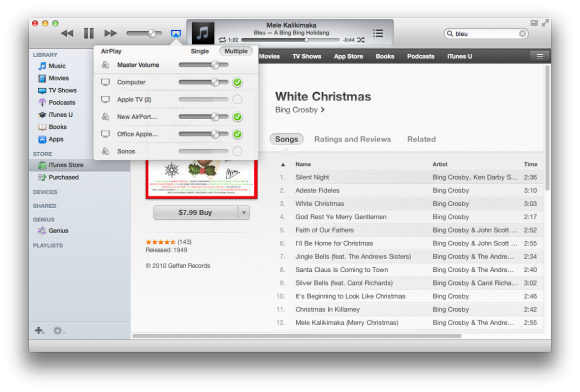 And, of course, you can always purchase more holiday music. As much fun as it is to give rather than receive, if you’re looking to pay less for seasonal music, keep an eye on Amazon MP3’s Holiday Music store. It’s not unusual at this time of year to find popular holiday albums discounted, as well as fairly generic instrumental collections that include dozens of hours of holiday cheer for just a few bucks. You'll even discover more than a few free seasonal tracks. The iTunes Store lacks these dirt-cheap instrumental compilations, but it does have a good selection of discounted holiday albums priced between 8 and 10 dollars. If you seek a collection of holiday music that can get you through the entire party you’re hosting, but would prefer to use your piggy bank to adequately fortify the eggnog, turn to Pandora. The free (with occasional audio ads) service has an extensive collection of holiday music. If you prefer your music ad-free, you can purchase a Pandora One subscription (which removes the ads) for $4 a month or $36 per year. You’ve never used Pandora? It works this way: Once you sign up for an account, you create stations (on the Pandora website) based on artists, genres, or tracks. For each station, Pandora streams music—from your computer or from free smartphone or tablet apps—that it thinks fits well with the artist, genre, or track you’ve chosen as the basis for that station. If you hear a track that you like (or hate), you rate it using simple thumbs-up and thumbs-down buttons—these ratings help Pandora choose future tracks to better fit your tastes. If you’re vigilant about training Pandora, you’ll be amazed at how good its choices become. 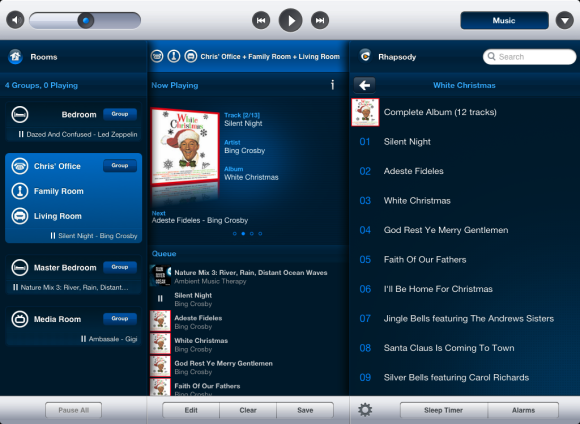 The trick to creating a good holiday station is cobbling together an accurate search on the Pandora website. You can do this by combining search terms. For example, entering Holiday will certainly generate a station full of seasonal melodies, but the variety will be extremely broad, which may cause you to spend more time than necessary using the Thumbs Up and Thumbs Down buttons. Instead, create a station along the lines of Holiday Soul James Brown for a festive and funky soundtrack. Or Holiday Elvis Presley for the King to give you some holiday hip action. 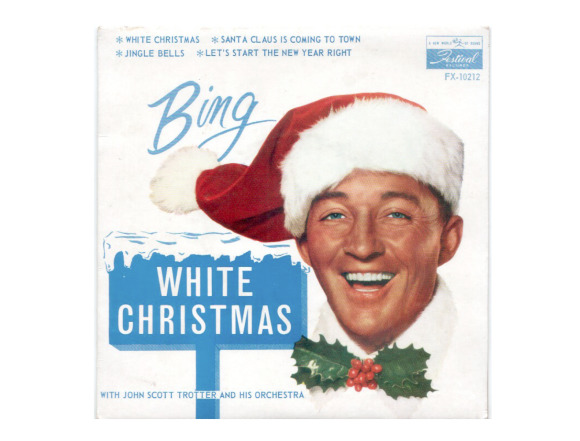 Or Lady Gaga White Christmas for, well, something unexpected. And by unexpected I mean that you should be sure that you’re familiar with the rendition of the seed track before pulling together your station. It turns out that Lady Gaga’s White Christmas is a traditional jazz arrangement. Subsequent tracks in that channel will be of a similar style rather than Gaga’s usual fare. If you find this to be too much bother, you needn’t construct stations from scratch. Pandora has created some for you, including a variety of holiday stations that include Classical Christmas, Country Christmas, Today’s Christmas, Hanukkah, Indie Holidays, R&B and Pop Holidays, Family Christmas, and Swingin’ Christmas. If you belong to a subscription music service such as MOG, Rdio, Rhapsody, Slacker, or Spotify, you’ll find that these services have similar holiday playlists, as well as Pandora-like stations. And because you have access to their libraries of millions of tracks, you can create some spectacular playlists of your own. And there you have it: the gear, the knowledge, and the music to make the holidays more happening. Regardless of how you feel about these celebrations, filling them with music—seasonal or not—will almost assuredly make your spirits brighter. Happy and harmonious holidays to you! Chris has covered technology and media since the latter days of the Reagan Administration. In addition to his journalistic endeavors, he's a professional musician in the San Francisco Bay Area.